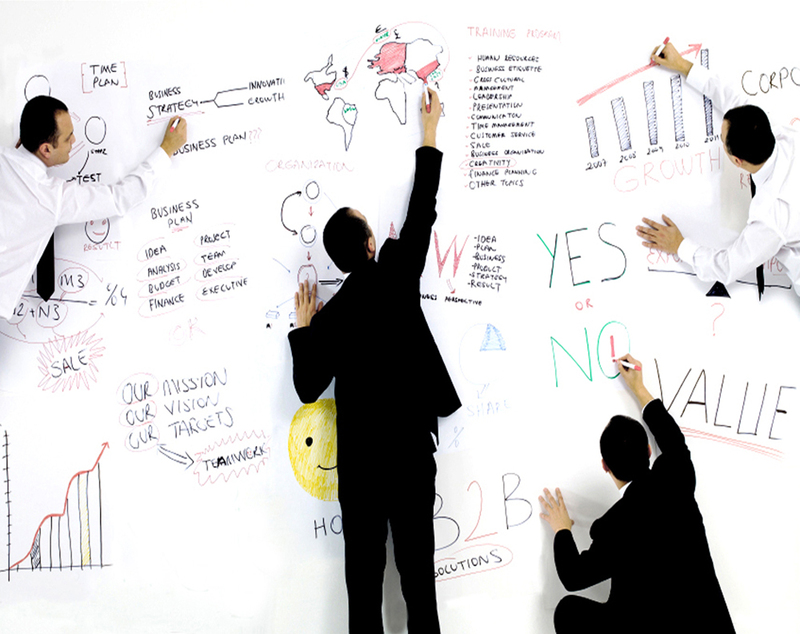 Dry-Erase Wall Sheets are lightweight, flexible dry-erase adhesive material that works on any wall, door or window. 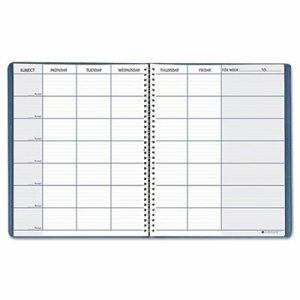 For writing plans, marking important dates, leaving messages or school activities. Just peel and stick with no tools required, cut down to any shape or paneled together for an entire Dry-Erase Wall. Available in 4 different sizes and with 4 colors to choose from. Get organized while supporting breast cancer research. Fashionable cover features the pink ribbon emblem, chocolate brown accents, a soft chocolate interior and a silvertone buckle. Stylish snap-tab closure. 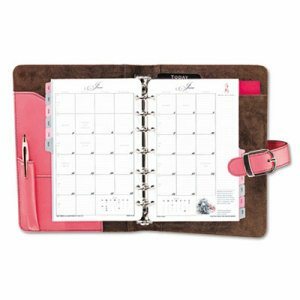 Pink Ribbon starter set features: 12 months of undated two-pages-per-week planning pages, 12 tabbed monthly dividers, tabbed telephone/address section, credit/business card holder, 24-sheet lined note pad, zip pouch and page locator. Also includes interior horizontal pocket. 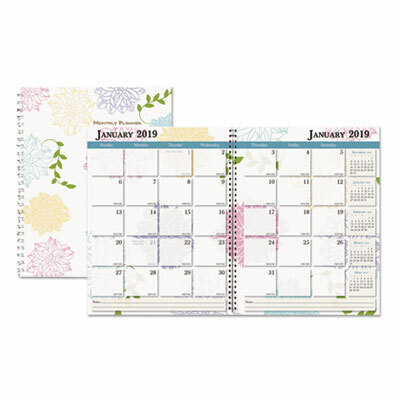 Size: 5 1/2 x 8 1/2; Page Color/Theme: Pink/White; Calendar Term: 12-Month (Jan.-Dec.); Page Format: One Month per Two-Page Spread; One Week per Two-Page Spread. Reversible for all of your planning needs. Features bold, large, easy-to-read print on bright white background. Wet-erase marker included. 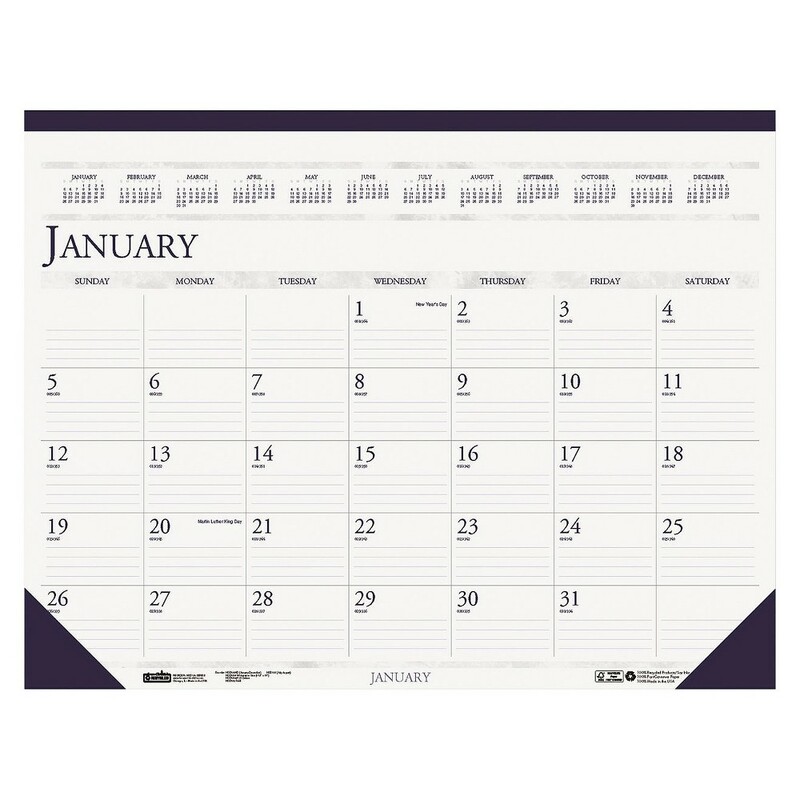 Size: 32 x 48; Page Color/Theme: Green/White; Edition Year: 2016; Calendar Term: 12-Month (Jan.-Dec.). For round the clock appointments. Schedule hourly appointments seven days a week. Standard and military time increments. Size: 7 x 10; Page Color/Theme: White; Appointment Ruling: 24 Hours Sun.-Sat. ; Edition Year: 2016. 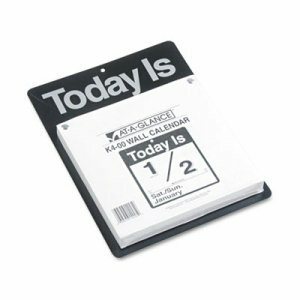 Professional desk pad calendar with bold, easy-to-read dates. One month per page, one ruled block per day. Reinforced chipboard back and vinyl corners. Tear-off sheets, bound at top. Yearly calendar at the bottom of each sheet. Size: 22 x 17; Page Color/Theme: White/Burgundy; Edition Year: 2016; Calendar Term: 12-Month (Jan.-Dec.). Half-hour appointment times. One day per two-page spread, ruled for appointments; Saturday/Sunday combined. Past, current and future months reference. Size: 3 1/2 x 6; Page Color/Theme: White; Appointment Ruling: 30-min, 7 AM to 5 PM (Mon-Fri); Edition Year: 2016. Classic lined format. One month per page with ruled blocks and lined notes space. Full-year calendar reference. Black paper headband with eyelets. 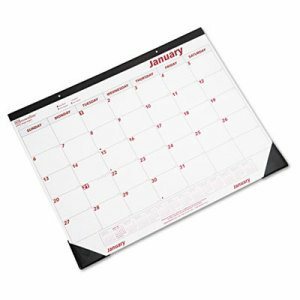 Size: 22 x 17; Page Color/Theme: White; Edition Year: 2016; Calendar Term: 12-Month (Jan.-Dec.). Handy teacher's helper features 40 undated weekly spreads, each divided into seven periods, with space for notes. Includes seating chart, term program, test and attendance records. Embossed simulated leather cover. This product was made from wood that came from a certified managed forest. 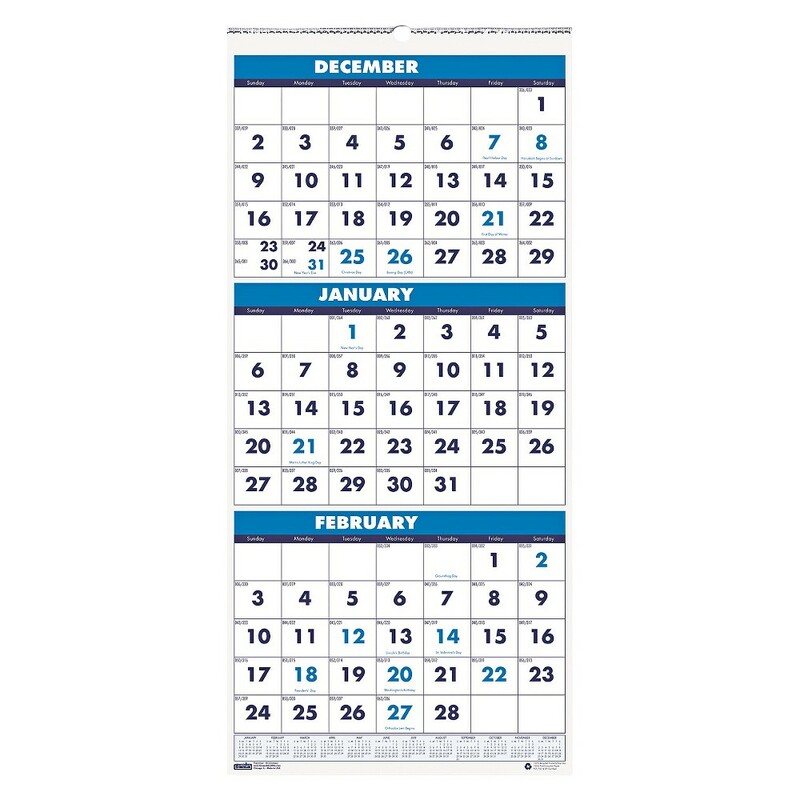 Size: 11 x 8 1/2; Page Color/Theme: Blue/White; Calendar Term: 40-Week; Page Format: 7 Class Periods per Day. Half-hour appointment times with monthly overviews. One day per two-page spread ruled for appointments; Saturday/Sunday combined. Monthly tabs for easy referencing of dates; lined for projects, to-do's and reminders. 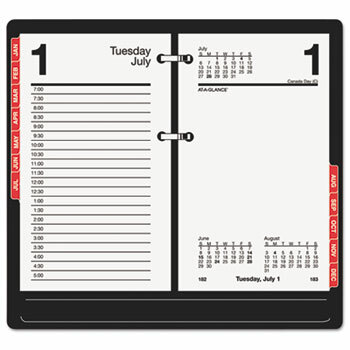 Tab set is printed in red; easy snap-in feature; can be used with all 17-style refills. Size: 3 1/2 x 6; Page Color/Theme: White; Appointment Ruling: 30-min, 7 AM to 5 PM (Mon-Fri); Edition Year: 2016. Past, present and future month on every page with unruled daily blocks and large, easy-to-see numbers. Full-year reference calendar. Wirebound with hanger. This product was made from wood that came from a certified managed forest. Size: 12 1/4 x 26; Page Color/Theme: Three-Month; Edition Year: 2015-2016; Calendar Term: 14-Month (Dec.-Jan.). Contemporary desk pad features a fashion-forward color scheme and design elements. Delivers monthly protection for your desktop with a full 12 months of planning from January - December. 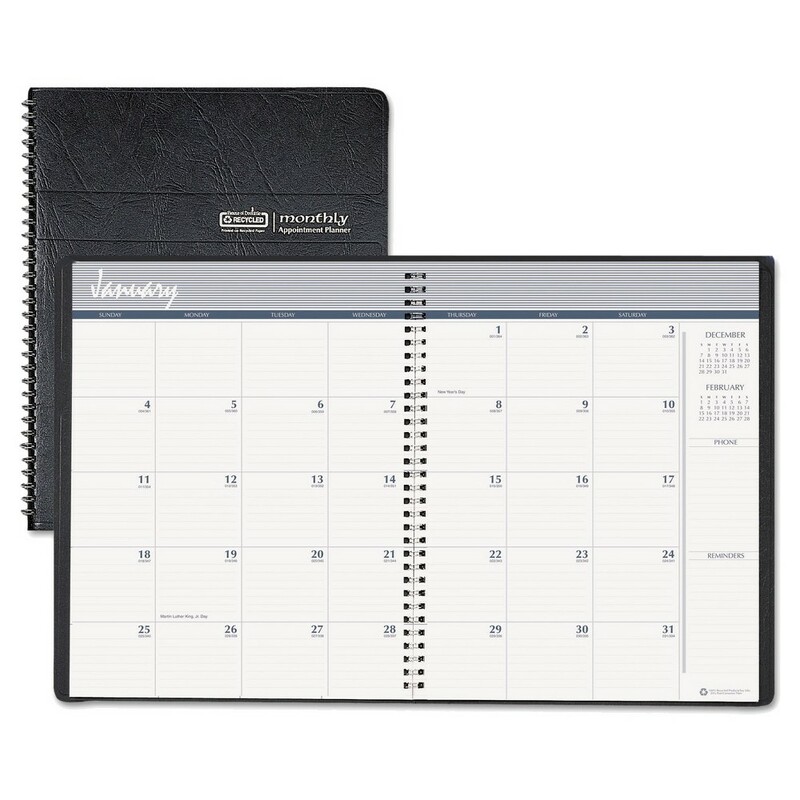 One month per page with unruled daily blocks provides space to write in notes and reminders on each date. Extra writing space for priorities is also included. Full year calendar reference on each monthly calendar page makes it easy to quickly look up dates. A 15-inch ruler on every page allows convenient measuring. 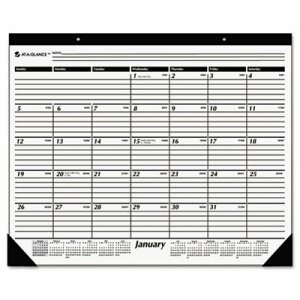 Contemporary design desk pad pages are white, and the year is foil stamped across the top. Two clear corners keep pages flat and prevent curling. Size: 22 x 17; Page Color/Theme: Contemporary; Appointment Ruling: Open Scheduling; Edition Year: 2019. 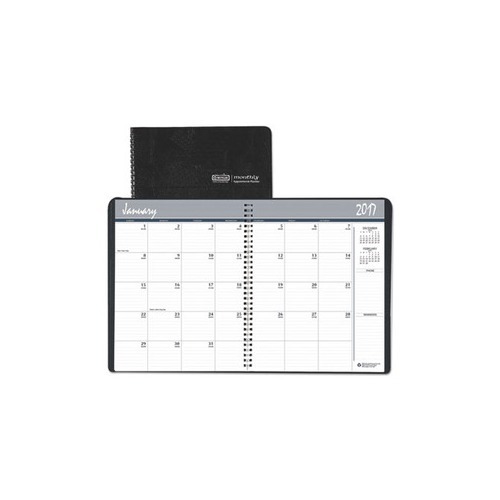 Keep track of important business meetings and dates with this monthly desk pad calendar. 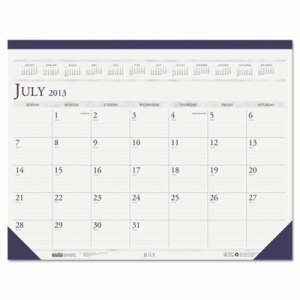 Featuring a sturdy chipboard back, one month is on each sheet, one block per day with large notes section. Yearly calendar at the bottom of each sheet. Size: 21 1/4 x 16; Page Color/Theme: Blue/White/Green; Edition Year: 2016; Calendar Term: 12-Month (Jan.-Dec.). 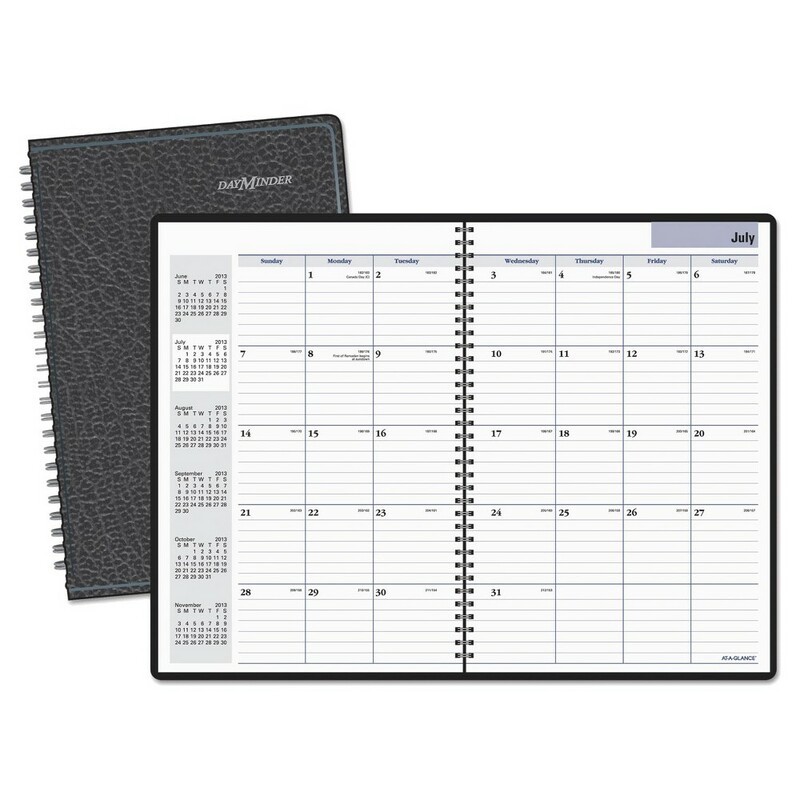 Unique 2-year planner facilitates long-range scheduling. Two pages per month with large 2-1/8 x 1-7/8 daily blocks. Past month and next month reference calendars. Embossed leatherette cover.  This product was made from wood sourced from a certified managed forest. Size: 8 1/2 x 11; Page Color/Theme: Blue/Black; Appointment Ruling: Ruled Daily Blocks; Edition Year: 2016-2017. 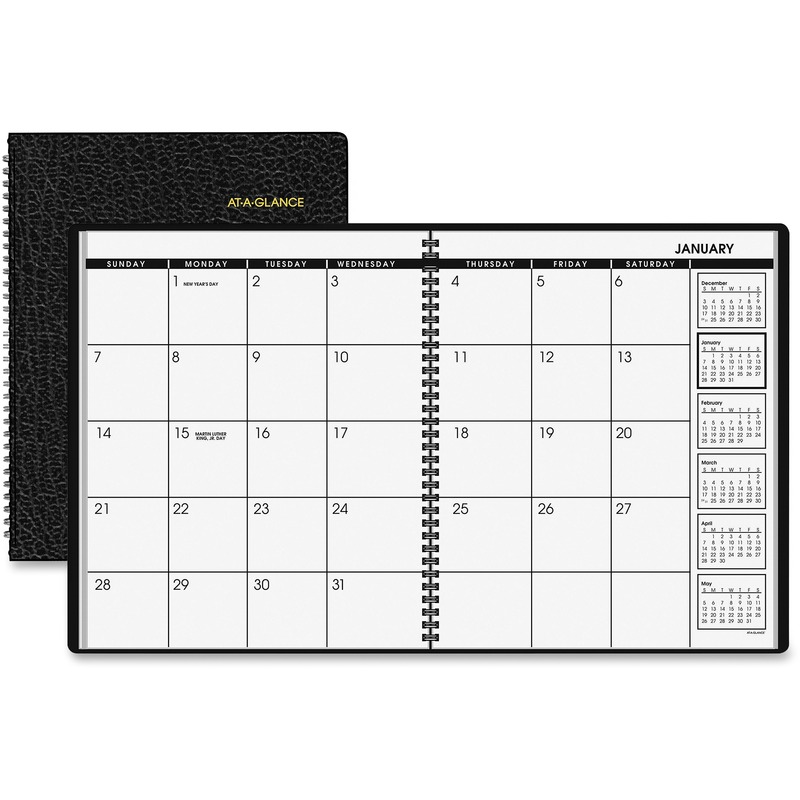 DayMinder "Recycled Monthly Academic Planner, Black, 7 7/8"" x 11 7/8"", 2014-2015" DayMinder "Recycled Monthly Academic Planner, Black, 7 7/8"" x 11 7/8"", 2014-2015"
Great for big picture monthly planning. One month per two-page spread; past, current and four future months reference. Academic year, features a page for future planning and phone numbers. Size: 7 7/8 x 11 7/8; Page Color/Theme: White; Appointment Ruling: Open Scheduling; Edition Year: 2015-2016. One-month view, plus a yearly calendar reference. Ruled daily blocks. Federal holidays printed in red. Wirebound with hanging loop. Full chipboard back. 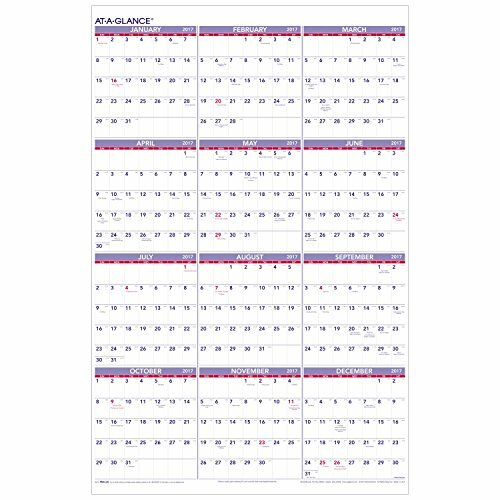 Size: 8 x 11; Page Color/Theme: White; Edition Year: 2016; Calendar Term: 12-Month (Jan.-Dec.). Hard cover is great for archiving. One month per two-page spread; past, current and four future months reference. Monthly tabs and storage pocket. Size: 7 7/8 x 11 7/8; Page Color/Theme: White; Appointment Ruling: Open Scheduling; Edition Year: 2015-2017. Perfect size for a smaller workplace. Julian dates show days remaining in the year. Full year calendar reference on the bottom of each month. Leatherette strip at top with perforated pages and matching reinforced corners at bottom. Lightly ruled 2 3/8" x 1 11/16" daily blocks keep notations neat. This product was made from wood sourced from a certified managed forest. Size: 18 1/2 x 13; Page Color/Theme: Blue; Edition Year: 2015-2016; Calendar Term: 14-Month (July-Aug.). 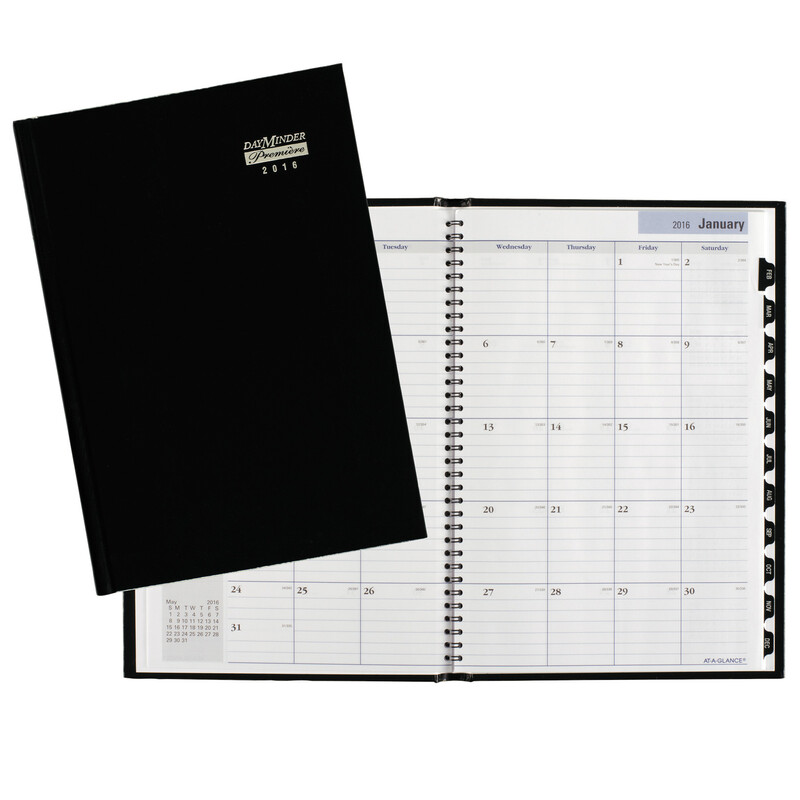 Classic black with space for notes each month. One month per page with unruled blocks and lined notes space. Full-year calendar reference. Size: 17 3/4 x 10 7/8; Page Color/Theme: White; Edition Year: 2016; Calendar Term: 12-Month (Jan.-Dec.). Features call loan table, monthly loan table and 30-days period table for one year; computes interest, elapsed time on notes and maturity dates. One day per two-page spread; ruled for half-hour appointments. Past-month reference and three-year advance planning calendar with U.S. Federal and Canadian holidays. Monthly tabs for easy referencing of dates. Size: 4 1/2 x 7 3/8; Page Color/Theme: White; Appointment Ruling: 30-min, 8 AM to 5:30 PM (Mon-Sat); Edition Year: 2016. 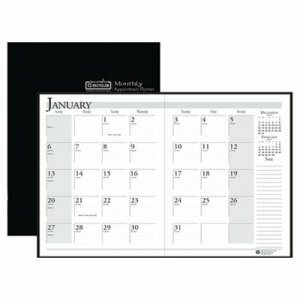 Desk Calendar Base, Black, 3 1/2" x 6" Desk Calendar Base, Black, 3 1/2" x 6"
Keep your busy schedule secure in this calender base. 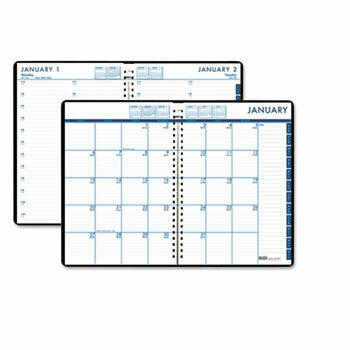 Two rings lock in a looseleaf calendar refill (SOLD SEPARATELY). Classic yet contemporary. 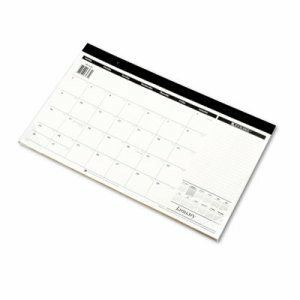 Standard base fits most looseleaf calendar refills up to 3 1/2 x 6. 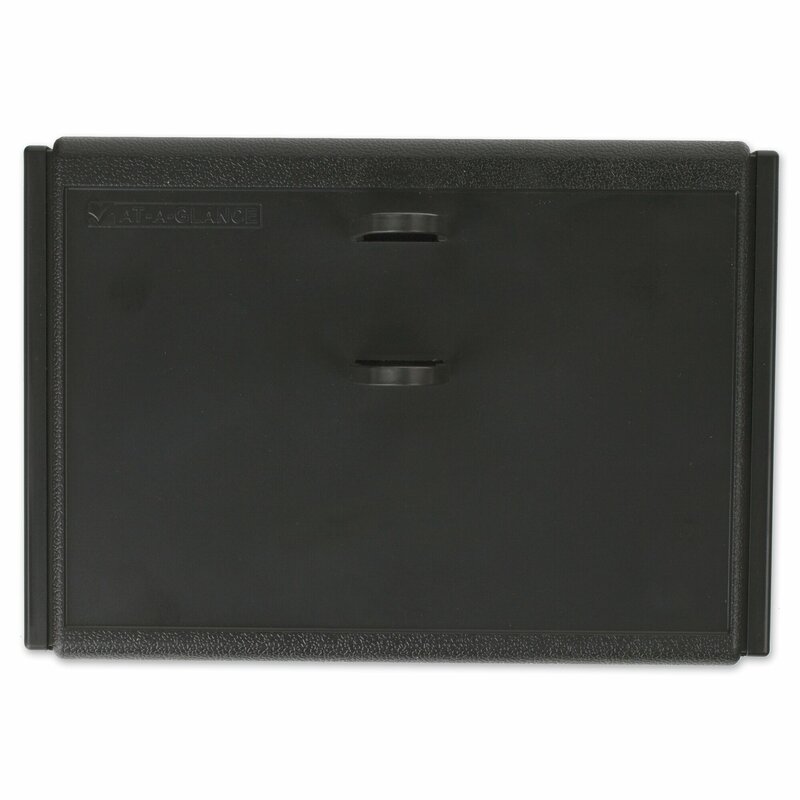 Size: 3 1/2 x 6 1/2; Color: Black; Material: Molded Plastic. Easy to hang with stiffener rods at top and bottom. Metal bound at top and bottom with hanging eyelet. Individually boxed. Contemporary design with plenty of writing space. 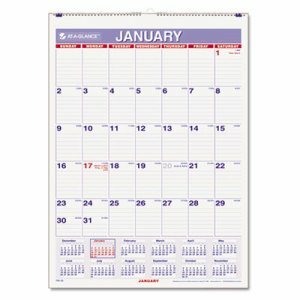 Size: 24 x 36; Page Color/Theme: White; Edition Year: 2016; Calendar Term: 12-Month (Jan.-Dec.). 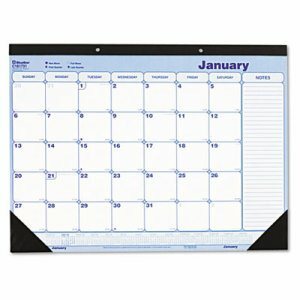 Desk Calendar Base, Black, 4 1/2" x 8" Desk Calendar Base, Black, 4 1/2" x 8"
Keep your busy schedule secure in this calender base. 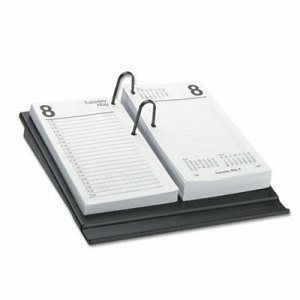 Two rings lock in a looseleaf calendar refill (SOLD SEPARATELY). Classic yet contemporary. 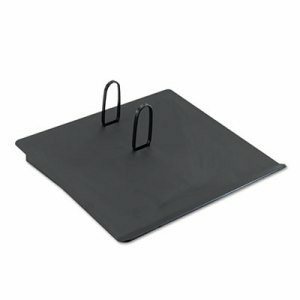 Size: 4 1/2 x 8; Color: Black; Material: Molded Plastic. Space for phone messages and reminders. Julian dates show days remaining in the year. Size: 8 1/2 x 11; Page Color/Theme: White; Appointment Ruling: None; Edition Year: 2015-2016. Perfect size for a smaller workplace. Julian dates show days remaining in the year. Full year calendar reference on the bottom of each month. Leatherette strip at top with perforated pages and matching reinforced corners at bottom. Lightly ruled 2 3/8" x 1 11/16" daily blocks keep notations neat. This product was made from wood sourced from a certified managed forest. Size: 22 x 17; Page Color/Theme: White; Edition Year: 2015-2016; Calendar Term: 14-Month (July-Aug.). Use this dependable classic to see one day at a time. One weekday per page, Saturday/Sunday combined. Features extra-large numbers on durable paper stock. Black rigid vinyl backboard with eyelet. Size: 9 3/8 x 12; Page Color/Theme: White; Edition Year: 2016; Calendar Term: 12-Month (Jan.-Dec.). Featuring a different coastline image for each month. Unruled daily blocks. Reinforced leatherette corners. Full year calendar reference blocks. 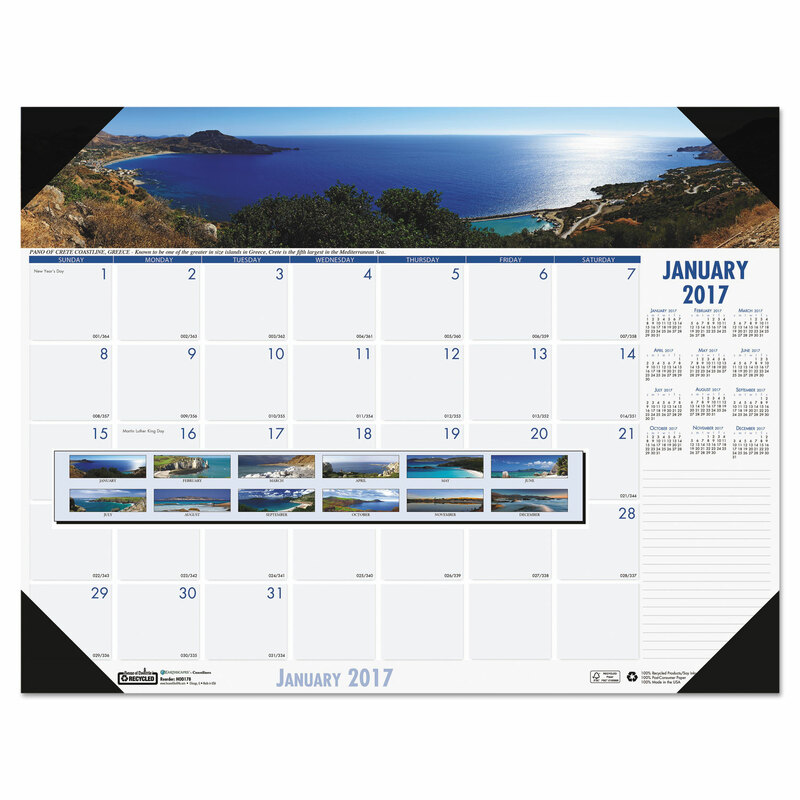 Size: 18 1/2 x 13; Page Color/Theme: Coastlines; Edition Year: 2016; Calendar Term: 12-Month (Jan.-Dec.). Elemental black-on-white in black holder for simplicity. Ruled daily blocks keep notations neat. 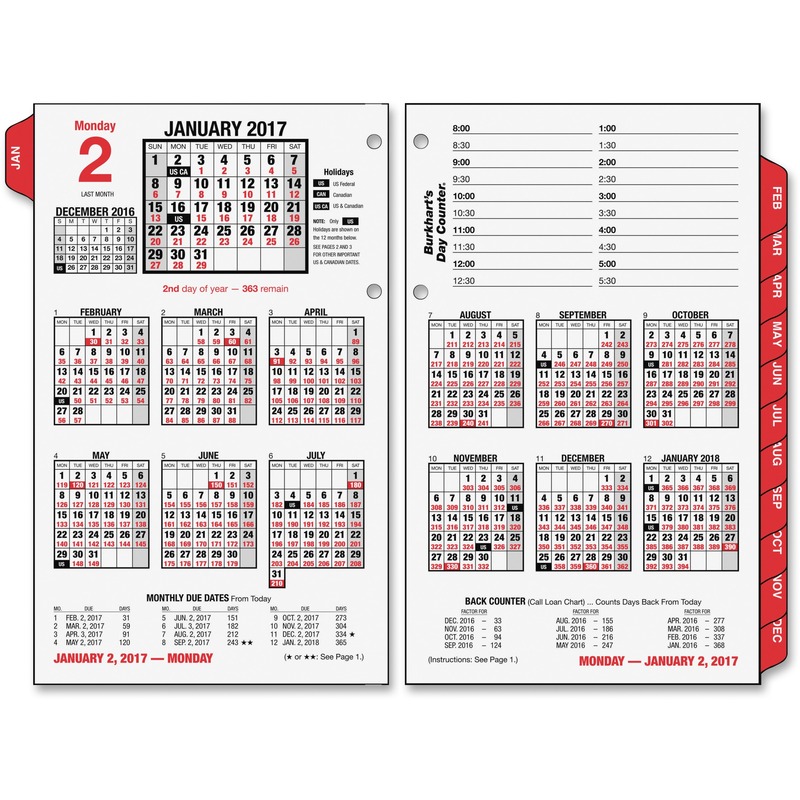 Full-year reference calendar makes planning easier. Reinforced leatherette corners. Compact size is great for workstations. Size: 18 1/2 x 13; Page Color/Theme: White; Edition Year: 2016; Calendar Term: 12-Month (Jan.-Dec.). 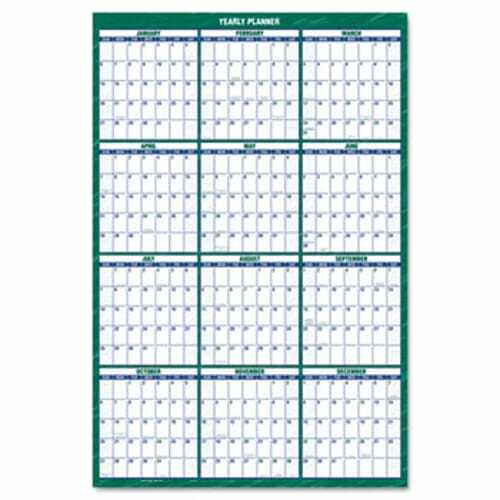 Great for big picture monthly planning. Premium paper resists ink bleed. Perforated memo section for easy tear-out notes. One month per two-page spread with unruled blocks; past, current and four future months reference. Telephone/address page. Size: 9 x 11; Page Color/Theme: White; Appointment Ruling: Open Scheduling; Edition Year: 2016-2017. The whimsical floral design is printed on the hard cover and throughout the book's monthly two-page spreads. The beautiful hard cover opens and folds over to create a sturdy writing surface and will endure frequent daily use. Size: 7 x 9; Page Color/Theme: Whimsical Floral; Edition Year: 2018; Calendar Term: 12-Month (Jan.-Dec.). Numbered weeks and shaded weekends. Ruled notes section on every spread. Size: 8 1/2 x 11; Page Color/Theme: Blue/Gray; Appointment Ruling: None; Edition Year: 2015-2016.